Vacations are so exciting! Hauling around lots of luggage, not so much. What if there were a way to get your bags from your starting point to your destination without having to haul them all over the place? There actually is a better alternative to trusting the airlines with your precious cargo. You can ship your luggage instead. If this sounds interesting to you, keep reading. You’re going to want to learn about these 5 great reasons to use a baggage delivery service. What Is Baggage Delivery Service? First off, what is a baggage delivery service? How does it work? The courier company will pick up your bags from your location and handle everything from there. They make sure everything is wrapped and sealed up tight so that your belongings arrive safely at your destination. Since your belongings will be traveling separately from you, you need some assurance they arrive. You’ll receive an email once your luggage has been delivered. It’s that easy. All you have to do is take your flight and your bags will be waiting at the hotel when you arrive. Now let’s take a look at those reasons why it’s such a great service. You take your luggage up to the counter and hand it to the smiling attendant. You watch it slide away on the conveyor belt and hope that you’re going to see it again at your destination. To be honest, most likely you will. With advances in technology, airlines are doing better at not losing people’s luggage. In fact, only about 6 bags per 1000 travelers are lost. But if yours turns out to be one of the unlucky six that’s going to put a damper on your vacation. Keep in mind that every connecting flight you have puts you at a higher risk for losing your bags. Every time your luggage changes planes is an opportunity for it to end up on the wrong flight or disappear completely. These days nearly all airlines charge baggage fees. You’re going to have to pay for baggage service anyway. Why not pay and know that your bags are going to be there when you arrive? You already tend to do a lot of waiting in line at airports. You have to go through security, you have to get your passport stamped, and if you want to buy food there’s usually a line for that too. Why not cut out some of that waiting in line? With a baggage delivery service, you don’t have to wait in line to check your bags. When your flight lands you don’t have to stand there waiting at the carousel to get your bags. Once you get your passport stamped you can just head straight out of the airport. Airlines deal with thousands upon thousands of travelers every day. The sheer volume makes it difficult to provide truly personalized attention. On the other hand, a courier service is smaller and can tailor their service to your needs. You’ll usually get an email alerting you when your baggage has arrived at your hotel. Plus, if you need to make any itinerary changes you can simply call the company and they’ll make sure your bags end up where they should. Traveling with unusually sized luggage can be a pain. Depending on its size and shape, the airline may charge you more in baggage fees. There’s also no guarantee it will arrive unscathed at your destination. Airline employees are notorious for being extremely hard on luggage. Unusually shaped or very large packages can often take the brunt of this. A baggage delivery service, however, will handle your luggage with care. It doesn’t matter how oddly-shaped or how large your luggage may be. Plus, they’ll have the equipment necessary to take good care of your stuff. One huge benefit to baggage delivery service is the ability to track luggage. This offers you the peace of mind that you need when traveling. Traveling is already stressful enough. Why make it harder on yourself? When you check your bags with the airline, you watch them roll away and hope you’ll see them again. With a baggage delivery service, you can follow your luggage as it goes on its journey. You can check in and see where it is at any given time right from your smartphone. As you can see from the other reasons, baggage delivery service is incredibly convenient. 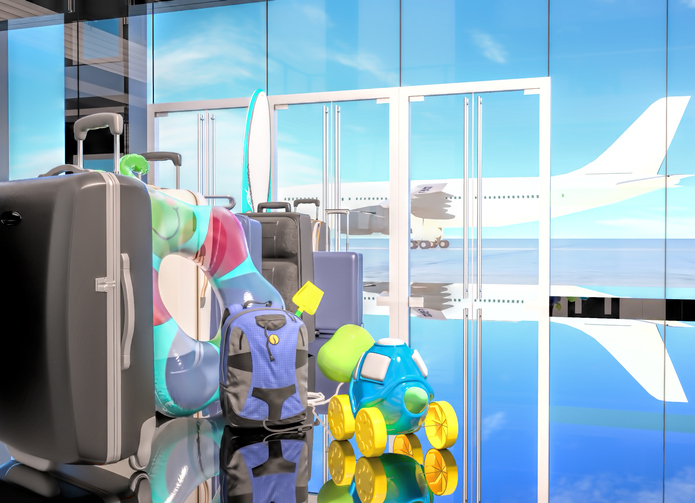 Whether you’re traveling with small children, folks with disabilities, or simply a lot of luggage, hauling your luggage around with you is a pain. With baggage delivery service you skip all that. You don’t have to haul it with you to the airport. You don’t have to wait in line to check it. You don’t have to pick it up from the carousel. And you don’t have to haul it to your hotel. You simply go and your bags will meet you there when you arrive. What do you think after reading about these great reasons to use a baggage delivery service? Are you ready to try it out for your next trip? Get a quote now to find out how affordable it is to get your baggage from one place to another. Plus, you can’t really put a price on the peace of mind that comes with knowing your stuff will be where you need it, when you need.